Brad Leisure started with the premise that Chrysler decided to go ahead and produce the turbine car body but not the turbine engine itself. In Brad's world, Ma MoPar decided to fit a 440 under the hood instead. 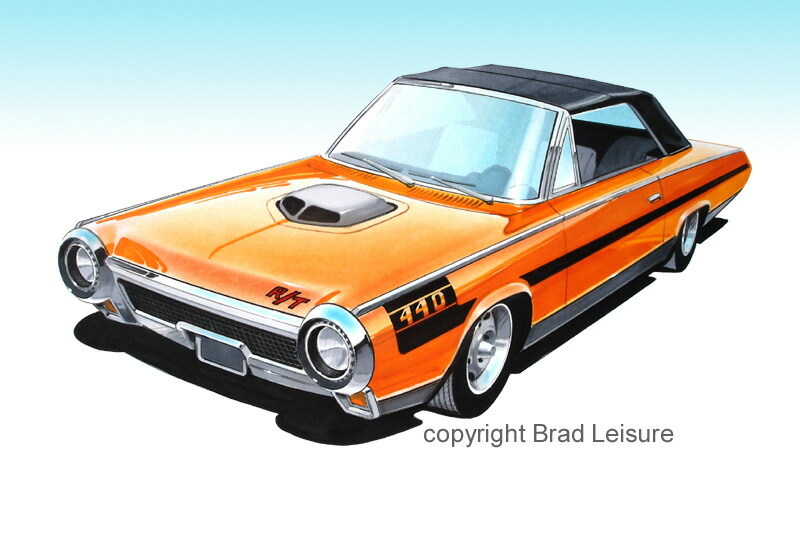 Brad used some well known MoPar styling cues and ended up with a Hemi Orange Turbine R/T convertible. This version features a shaker hood, road wheels and hockey stick stripes. Since the car design was looking into the future, Brad included performance options that would become more common place years down the road. 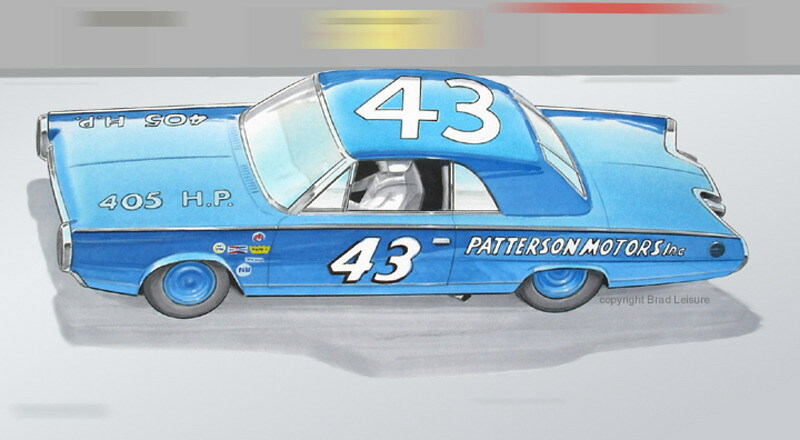 If you follow that line of though, it would only be obvious that there would have to be a Richard Petty version. Chrysler wouldn't let there latest design sit on the side lines at any major NASCAR event. In real life NASCAR would have probably out-lawed that before it ever ran but we can dream can't we! "The destruction of forty six of the fifty five Ghia cars produced for the turbine program was because the import tax on the bodies was too much for Chrysler to pay." Chrysler even put that reason in most press releases but after I have talked to many people involved in the program and the overwhelming reason is displayed in the art work Brad has done here. That is - If Chrysler had let the turbine car bodies out to the public someone would have made one of the above cars - probably not as beautiful of a job as Brad has done here but you get the idea. One accident, one race, one person doing something stupid in a car that looked like a turbine car and all the good will created by the program could have come to a very bad end. Chrysler had spent a lot of money for the Ghia bodies because they wanted them to be attractive, futuristic, and easy to identify as a experimental car. Chrysler left a lot of the sound un-muffled on the turbine car for the same reason - that is to be sure when you saw one of them, you knew it was a turbine and it was a Chrysler product. I am sure that the legal department and public relations were the real reason the cars were destroyed - it is called "risk management" - no cars in private hands - no risk! Money was involved but the small amount of import duty was a good excuse - when you think how much they paid for each of the cars why would they NOT spend a few dollars more to keep them around. In fact, I talked to one individual who told me that Chrysler tried to place every one of the fifty user cars into a museum somewhere but they could not find enough museums that were willing to take a non-functional display vehicle. They were all shipped as just that - static displays - the operating engines were shipped to the museums at a later date when Chrysler was cleaning out old stuff and decided having the engines with the cars would be a good idea. I hope people quit blaming the government for making Chrysler destroy the cars, they were just doing what they always do and Chrysler like all big companies did what they do. I still like very much what Brad has done here - I like the artwork and the concept - I hope you do to. The styling of the Ghia cars was in many was so beautiful - yet simple. Thanks Brad for sharing. Brad is a fellow MoPar nut and own's a 59 Desoto - he also collects memorbilia.